Iya Terra wrapped up their first west coast headlining tour, The Stars Tour, on November 17th at Marty’s on Newport in Tustin, CA. This two-week tour spanned all the way up from Seattle down to San Diego, including supporting act Dubbest. Each night, fans showed up early to support both bands, but this night in particular, there was a large line outside before doors even opened! 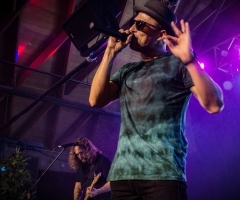 By the time Dubbest came on, the show was sold out and the venue was packed with people ready to dance and sing their hearts out to some of their favorite bands. It was truly amazing to feel the energy in the room. Iya Terra is quickly earning their way into everyone’s hearts. Dubbest started out the night and immediately had the crowd feeling good. 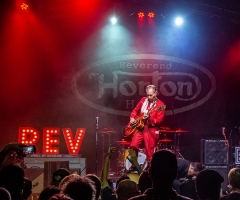 The venue was crowded and hot, but that didn’t stop people from groovin’ to their sweet sounds. Dubbest is one of the most underrated bands in my opinion. Their style is dynamic and unique, yet their soulful vocals, poetic lyrics and upbeat songs evoke the days of old-school roots reggae music. I had a smile on my face during the whole set. Every song they have is catchy, easy to move to and just makes you feel happy... not to mention, they’re incredible musicians! 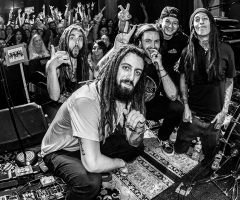 There’s not much more you could ask for in a reggae band. Iya Terra’s revamped set has made this tour extra special. 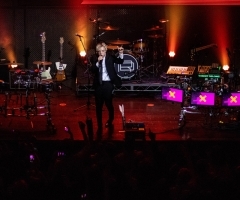 They came out with a brand new, head-banging intro which transitioned into one of their older songs they haven’t played live in a while, “Iya Lovin”. They played both of their latest singles “Stars” and “Marching On”, the latter featuring Jesse Royal. Iya Terra always keeps their live performances entertaining. They mix it up between shredding guitar solos, crisp vocals and harmonies, and slower songs like “Nice It Up”. They also paid tribute to some of their idols by covering parts of songs from Bob Marley, Alborosie, Pink Floyd and Jimi Hendrix. The band finished their set by going into an awesome reggae version of “Little Wing” before coming back out for an encore. By this time in the night, the crowd was raging. This wasn’t always how it was for Iya Terra, though. From seeing barely 30 people show up to one of their shows just a few years ago to them selling out venues with fans singing along to every word each night of this tour truly shows how Iya Terra is quickly earning their way into everyone’s hearts. This night at Marty’s On Newport was unforgettable for the band, crew and fans; I cannot wait to see where Iya Terra and Dubbest go next!